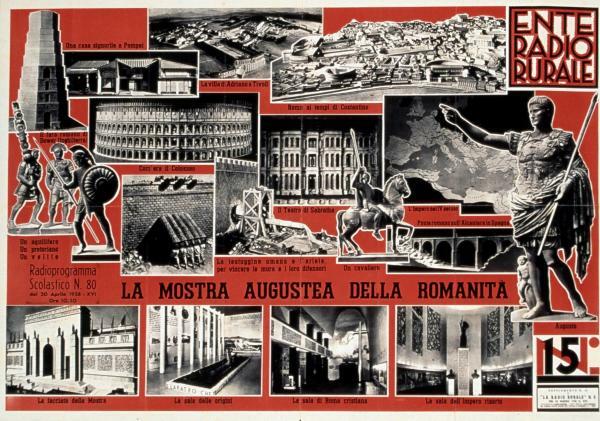 This lecture focuses on a series of highly provocative posters produced by the state-sponsored Ente Radio Rurale, which, beginning in 1933, broadcast a weekly series of educational radio programs aimed at children living in Italian rural communities, and especially Mussolini’s so-called “new towns” (città nuove), or communities developed through land reclamation (bonifica). As such, these radio programs were in fact many Italians’ first exposure to cultural and political topics, as well as the newly standardized Italian language itself. These striking combinations of black-and-white photographs, maps, cartoons, and modern typesets addressed subjects ranging from Italian colonialism, war, and cultural regionalism to special exhibitions and more general concepts linked to fascist propaganda, such as mare nostrum.